The ‘toast to the ghost’ has become a tradition at a number of distilleries, including Glenrothes where we start our spooky sojourn. Over the years, many a dram has been sunk to the memory of one Biawa ‘Byeway’ Makalaga. One of two African boys rescued from famine in Matabeleland at the turn of the 20th century by Major James Grant, owner of Glen Grant, Biawa served as the eccentric Major’s page boy and then butler. He continued to live in Glen Grant House until his death in 1972, outliving the Major by more than 40 years. Seven years later, following the installation of a new pair of stills at nearby Glenrothes, the ghost of Biawa appeared on two occasions. Step forward university professor Cedric Wilson; on investigation, he discovered that the shiny new stills had unwittingly disturbed a leyline. After he set this right, Wilson was lost in thought for some moments. He then went to the neighbouring graveyard and appeared to ‘have a bit of a chat’ with a gravestone; it was that of Biawa Makalaga – and, afterwards, the issue was said to have been amicably resolved. Biawa has never been seen since, but the folk at Glenrothes aren’t taking any chances: there have been many, many ‘toasts to the ghost’ in the years since, typically with a glass of Glenrothes (although a dram of Glen Grant might be equally appropriate…). In 1781, Laird Archibald Campbell outlawed distilling on the island and, 29 years later, he awoke (sober, of course) in the middle of the night to see a ghostly old woman hovering over his bed. She was angry at the lack of whisky on the island, and the fright moved Campbell to reverse the ban and build a distillery in an old smugglers’ cave at Craighouse. The plant has been through closures and revamps since 1810, but, through all the ups and downs, a bottle of 16-year-old has remained in the cave to appease the old woman. Fast-forward to 2010 and Elvis (the distillery cat) snapped a ghostly apparition on his cat cam. Psychic Joan Charles came to stay in the distillery lodge and sensed the presence of a woman who was strong, authoritative and kind. Her name? Elizabeth Quinn, said Charles – and then distillery manager Willie Cochrane confirmed that there had been a schoolteacher called Elizabeth who lived on the island many, many years before. Meanwhile, Jura brand ambassador Willie Tait awoke one night in the lodge to hear a voice telling him: ‘The children are alright.’ Which was nice. The story goes that Islay crofter Lachlan Bàn was returning home one dark and stormy night when he saw the ghostly silhouette of a headless horseman galloping away from his house. Despite lacking a head, the horseman was clearly a convivial type: he appeared to have left Bàn a bottle of Bowmore (but only after taking a dram himself). When Bàn walked in, the bottle stood open on the table and the fire had gone out. Thoroughly terrified, he didn’t fancy keeping the ghost’s gift, so he threw it away. Of course there’s a logical explanation for all of this. According to Bowmore, Bàn’s brother later told him: ‘Lachlan, I passed last Friday night during that dreadful storm. Once Bàn heard this, he was – perhaps understandably – too embarrassed to tell the islanders the truth. So, even now, a true Ileach (native of Islay) will always open a fresh bottle for guests. Glenmorangie’s ghost seems to have a penchant for interior design – and impressive DIY skills. The White Lady, as she is known, used to do most of her haunting around the distillery’s (now decommissioned) floor maltings, but is also said to have removed whole sheets of wallpaper without even causing a tear. But there may be an altogether more prosaic explanation for the ghostly goings-on: night shifts. We continue our ghost hunt in Campbeltown at the Glen Scotia distillery. On the night before Christmas Eve 1930, local industrialist and distillery owner Duncan MacCallum died in what today’s distillery manager Iain McAlister calls ‘mysterious circumstances’. The story goes that he drowned himself in Crosshill Loch, the distillery’s water supply. According to Berry Bros & Rudd, McCallum was moved to taking his own life by losing a fortune in a crooked business deal. 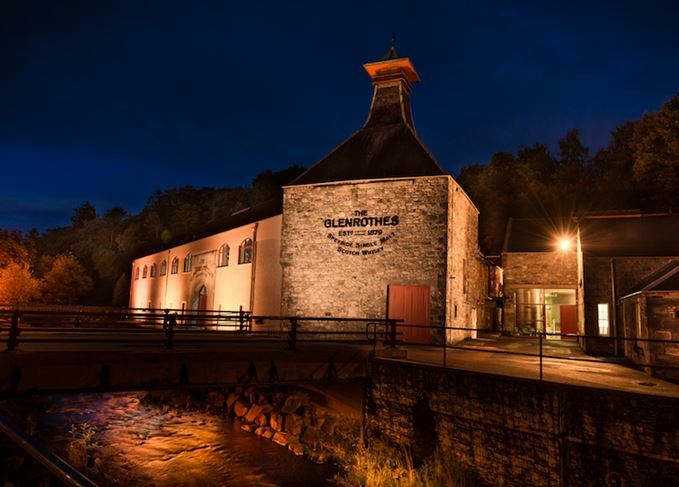 Whatever the truth of the matter, his ghost remains at the distillery to this day – meaning that many employees won’t venture into certain areas after dark. We close our spooky Scotch odyssey with a visit to GlenDronach in the Highlands, best-known for its Sherried whiskies. Workers at the distillery got more than they bargained for when they unloaded some casks brought over from Spain... none other than the distillery’s ghost, known as The Spanish Lady. The spooky señorita is said to have arrived (in an oloroso cask) at one of the distillery’s traditional dunnage warehouses. But, according to the folks at GlenDronach, the transition from Spanish sun to the cold and damp of Aberdeenshire was not a happy one: she was desperately lonely there and found an underground tunnel that led to nearby Glen House, where she found ‘peace, comfort and lots of human spirits to keep her company’. Very sensibly, The Spanish Lady chose to haunt the bedroom named GlenDronach – and many guests have since seen her or felt her presence… especially late at night, after a few drams.